Open Site Explorer is a tool used to research the link profile of a website. It will show you the quality of inbound links using metrics like Page Authority, Domain Authority, and Spam Score. You can do a good amount of research with the free version, but to enjoy all its capabilities you’ll need full access; you can get that access for free with a 30-day trial of Moz Pro. I suggest opening your competitor’s site in a browser window and then copying the URL. This will reduce any spelling errors and the possibility of incorrectly typing the domain name. An example of a common error is incorrectly adding “www” to the URL when that’s not how it renders for the site. 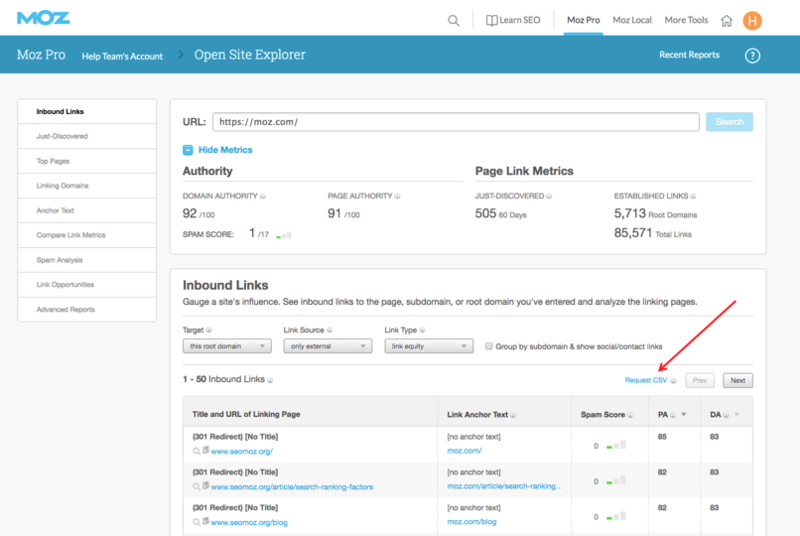 The Inbound Links tab will display all of the pages that link to your competitor’s website. In order to identify sources of links that are delivering link equity, I set the parameters above the list as follows: Target This – Root Domain, Links Source – Only External, and Link Type – Link Equity. This will show all external links providing link equity to any page on your competitor’s site. Most reports in Open Site Explorer will allow you to export to .csv. Save these results and then repeat for your other competitors. Once you have Open Site Explorer exports from the top 5–10 competitors, compile them into one spreadsheet. Page Authority is a 1–100 scale developed by Moz that estimates the likelihood of a page’s ability to rank in a search result, based on our understanding of essential ranking factors. Higher numbers suggest the page is more authoritative and therefore has a higher likelihood of ranking. Higher Page Authority pages also will be delivering more link equity to your competitor’s site. Use Page Authority as your sorting criteria. Now you have a large list of sites linking to your competitors for keywords you are targeting. Go down the list of high Page Authority links and look for sites or authors that show up regularly. Use your preferred outreach strategy to contact these sites and begin developing a relationship. To get more information, please consult our SEO Team Now !